Packed with zingy spring onion, sweet red pepper and smoky paprika, these vegetarian sweetcorn fritters celebrate the fresh flavours of Mexican cuisine. 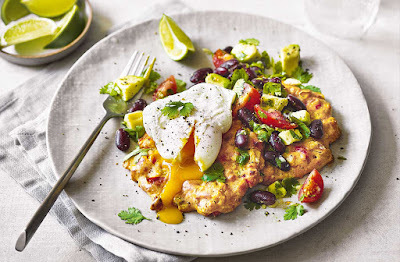 Pair with a hearty salad combining creamy avocado, zesty lime and kidney beans, and top with a runny poached egg for an extra treat. Preheat the oven to gas 6, 200°C, fan 180°C. Line 2 baking trays with nonstick baking paper. Heat ½ tbsp oil in a frying pan over a medium heat. Fry the pepper for 5 mins, then add the spring onions and garlic; fry for 2 mins. Transfer to a large bowl; cool for 5 mins. Add the sweetcorn, flour and paprika to the bowl; season and mix well. Add 3 tbsp water and 2 eggs and combine. Divide the mix into 8 equal mounds on the trays, then spread each into a 1cm-thick circle. Bake for 10 mins, then flip and bake for 8-10 mins until golden. Meanwhile, mix the salad ingredients in a bowl with ½ tbsp oil; season. To poach the eggs, bring a large pan of water to the boil, then reduce the heat until barely simmering. Swirl the water with a wooden spoon to create a whirlpool and carefully crack 1 egg into the centre; immediately repeat with a second egg. Cook for 3 mins until the whites are just set and the yolks runny. Repeat with the remaining 2 eggs. Serve 2 fritters each, with an egg on top and the salad alongside. Garnish with lime wedges, black pepper and extra coriander.